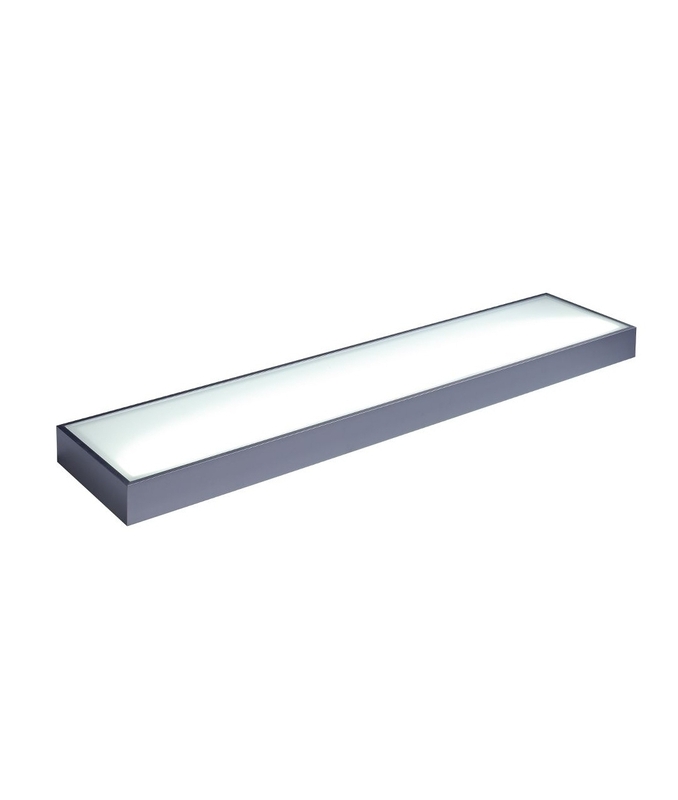 A very popular illuminated shelf with extruded aluminium profile surround in a hard anodised matt finish. The top glass can be removed to allow access to wiring. The bottom glass is fixed in place and has a round rocker switch meaning the light can be switched on or off locally. The toughened glass top and bottom is opaque. 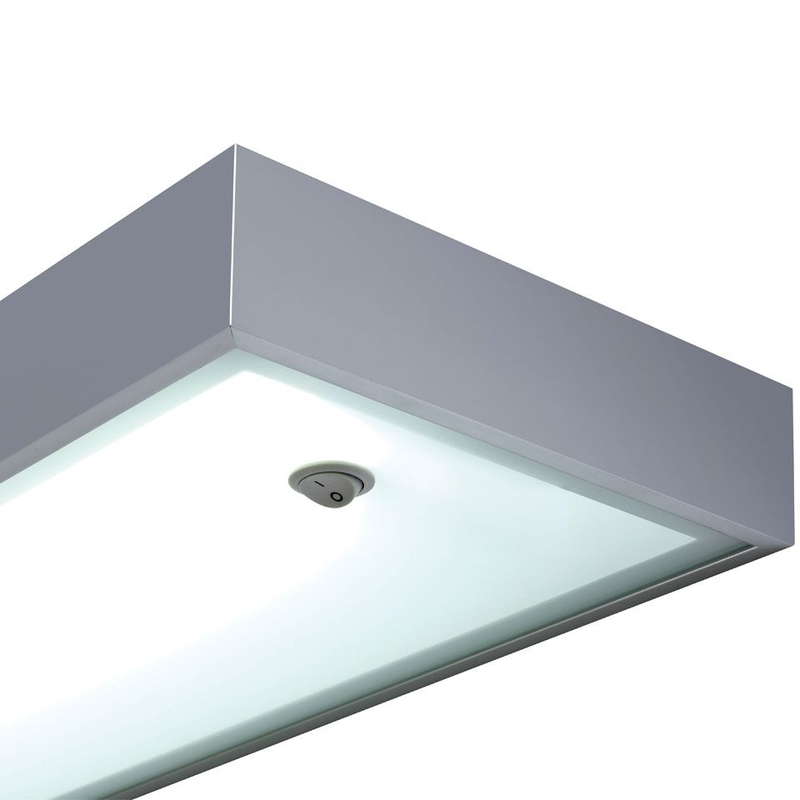 The 50mm thick shelf unit houses an integrated LED light fixture, this has a total lamp life of 50,000 hours, 50 times longer than a normal T5 fluorescent. Producing a very cool white (6000°k) light these create a clean, modern effect. Easy installation system means brackets are fixed to the wall and the shelf hangs on these. The cable entry is on the rear but it is easy enough to drill a new hole if this position does not suit your needs. Toughened glass top and bottom in extruded aluminium casing - with hard anodised finish. What is the maximum load capacity for each shelf. The maximum weight load is 5 kilos. CAN THE SHLVES BE FITTED EASILY END TO END TO MAKE A LONGER SHELF? The shelves can be installed next to each other, This would create a longer shelf, each shelf would require its own mains power however. How long is the power lead that comes with the shelf and can it be plugged into a socket instead of being wired into the mains. There is no cable supplied with the shelf. You could add a trailing lead with a plug if you wish to use a socket. We would suggest a height of at least 60cm but you may not be a fan of the greasy dust and soot that would stick to the shelf. Can this light shelf be used above a gas hob? This is made of aluminium and glass and so there is no reason as to why this cannot be installed above a gas hob within a reasonable distance. When looking at the shelf in the pictures, The Feed is located on the right. What is the max load bearing capacity of the shelf and can it be mounted on a hollow plasterboard wall? The maximum bearing load is 5kg. You can mount it on to a hallow plasterboard wall, we would recommend using spring toggles. The finish on the shelf is a brushed Aluminium. The only way you can get the supply to the shelf is through the back of it. Going through the top will effect how the shelf fits to the wall. Do these shelves need to be fitted by an electrician because they are mains powered? These are mains powered, If unsure on how to install we would recommend using a qualified Electrician. The LEDs and built in driver on this shelf is non dimmable. Do you supply replacement top glass panel? Unfortunately we do not supply replacement glass as the shelf comes as a complete unit. How do you remove the strip bulb from the light box? These fittings come with integral LED lamps. The LED lamp is non replaceable, but with a 25,000 hour lamp life, it will last and should not need to be changed. Are these LED box shelves mains-powered or do they need a transformer? These are mains powered and the driver is built in. Is this shelf suitable above a kitchen sink and what would be the advisable minimum distance between the sink and the base of the shelf be? This shelf is rated IP21 so must be at least 60cm from any water source, i.e. the sink taps. Does this shelf come in a 1200mm length? 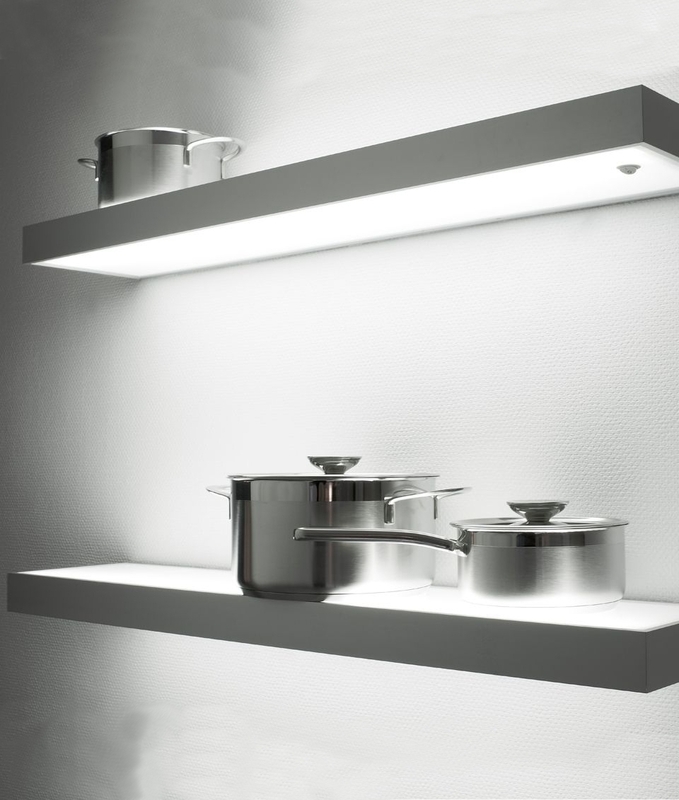 This LED box shelf only comes in 3 sizes. With the longest being 900mm. As you look at the mounted shelf from the front, which side does the trailing lead come from? Trailing leads on all shelves are located on the right, please call us if you require the exact measurement. Could you tell me what colour the switch is and if it is located on the underside of the shelf? The switch is a grey colour, and is hidden underneath the shelf on the right hand side. Are these shelves suitable for bathroom? Can this product be fitted to a glass splashback? There are three mounting brackets supplied with the larger shelves. You would need to drill through the glass deco panel to the masonry behind and locate a rawl plug. Take care not to over tighten the fixing screws of your glass will be damaged. The shelf hangs on these fixing brackets rather like those used on kitchen wall cabinets.